Dererk Pardon put up 20 points in a losing effort for NU on Sunday. Let's not sugar coat this – Northwestern has not looked like a team that can make a second consecutive visit to the NCAA Tournament to this point in the season. Even in their wins, the 'Cats have dragged their feet on many occasions. But on Sunday afternoon in West Lafayette, Indiana, against a stout Purdue team, the 'Cats laid waste to that narrative ... and still lost. NU and Purdue traded blows for 40 minutes, but the Boilers landed just a few more than the 'Cats did, handing NU its third loss in its last five games, 74-69. 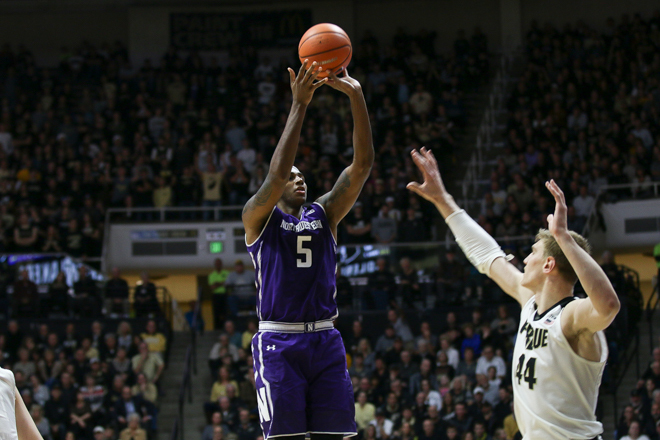 NU squandered a valiant 20-point, eight rebound, four assist effort from Dererk Pardon. Two go-ahead buckets by Scottie Lindsey with under two minutes to play were matched by Isaac Haas, who scored 27 points, on each occasion, and the senior big man gave Purdue a 71-69 edge with a layup at the 43 second mark that ended up being the difference. Lindsey and Bryant McIntosh had chances to tie it in the waning seconds, but came up just short on their shots. Lindsey was visibly upset after his miss, indicating he thought he'd been fouled. Coach Chris Collins was visibly upset after the game, too, for the same reason. "Guys, look at the stat sheet, 24 [free throws by Purdue]-5 [for Northwestern]," Collins said. "He got hit. Of course he did. But you're not gonna win on the road when you shoot five free throws and the other team shoots 25 against the most physical team in our league. It's tough." The narrative for NU's largely disappointing start to 2017-18 played itself out to a T through the first ten minutes of the game. NU looked sloppy, and the cacophonous noise of Mackey Arena grew louder and louder with each effortless Purdue basket and defensive stop. The Boilermakers looked destined to cruise to victory while NU looked destined to board the bus back to Evanston with more questions than answers for the fourth time this season. Then, somehow, as if Collins and the boys knew I was penning a tale of their team's demise, the 'Cats came alive. Led by seven points from oft-maligned backup guard Isiah Brown and 11 from Scottie Lindsey, NU ran right by the Boilermakers and quieted the crowd. Brown actually helped NU nab the lead on two occasions late in the half. The teams were deadlocked at 33 at the half. "It was great, I was really proud of [Brown]," Collins said. "He missed about a month in the preseason and he's been working hard to get his timing and his shape. His production off the bench was really good for us today." NU held Purdue to just 38 percent shooting from the field, and, despite Actual Bear Man Isaac Haas clogging up the paint, only lost the rebounding battle 22-21. It was, by any indications, anybody's game. As one might expect, Purdue came out swinging in the second half. But NU hung with them, never falling behind by any more than five in the first ten minutes of the second half. Again it was Isiah Brown leading the charge. NU grabbed the lead once again on a Dererk Pardon jumper, and forced a time out from Purdue with a Vic Law three that gave NU a 51-49 lead with 10:38 left. From that point on, NU and Purdue were engaged in a tight battle that the Boilermakers ultimately won. The offense ran through Pardon in the second half, and after an underwhelming performance against Illinois on Friday, the big man stuffed the stat sheet. But Collins said he was receiving stitches after the game from an elbow to the mouth by Isaac Haas, which was not called a foul. "He made a lot of mid range jump shots, which is something he's been working on," Collins said. "I just thought his activity, he played well, with a lot of confidence. ... We encouraged him to take those shots." Here are the facts: Northwestern men's basketball is 5-4, and 1-1 in B1G play. It's fruitless to show you a side-by-side comparison to last year's record to this point, or remind you that NU started last year 18-4. The schedules are configured too differently (not to mention this new early December B1G games thing). Here is an opinion: NU is a good team when it gets contributions from the bench like it did today. Finding consistency from that unit will be key, and it needs to happen sooner rather than later, before this spirals into a hole that the 'Cats will find too deep to climb out of.